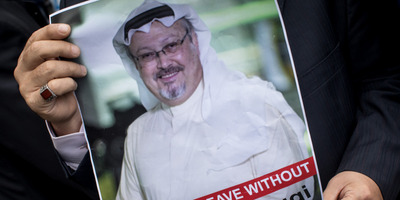 Chris McGrath/Getty ImagesJamal Khashoggi is featured on a poster during a protest organised by members of the Turkish-Arabic Media Association at the entrance to Saudi Arabia’s consulate on October 8, 2018 in Istanbul, Turkey. Jamal Khashoggi was barred from writing and making public appearances by the Saudi royal family after he criticised President Donald Trump in late 2016. Khashoggi went into self-imposed exile not long after the ban so he could continue reporting. 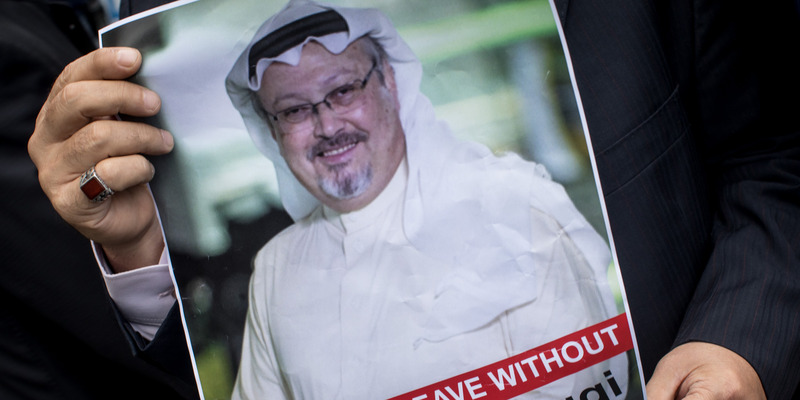 Khashoggi became a US resident and wrote for The Washington Post, continuing to criticise the kingdom’s policies from afar. Khashoggi was killed in the Saudi Consulate in Istanbul on October 2. Trump on Tuesday issued a forceful defence of the Saudis over Khashoggi’s killing, sparking widespread condemnation. Since Jamal Khashoggi was killed after entering the Saudi Consulate in Istanbul in early October, he has been widely characterised as a dissident. Khashoggi considered himself a patriot, rejecting the term dissident, but he was often critical of the Saudi government in his reporting. But Saudi Arabia’s government actually barred him from appearing in media there after he criticised President Donald Trump in late 2016, according to the US State Department. Khashoggi had criticised Trump’s stance and rhetoric on the Middle East in an appearance at a Washington, DC, think tank. “The expectation that ‘Trump as president’ will be starkly different from ‘Trump as candidate’ is a false hope at best,” Khashoggi said at the time. Khashoggi left his native country roughly six months after the ban in June 2017, which also prohibited him from making TV appearances and attending conferences. He became a US resident – splitting time between Virginia, Istanbul, and London – and wrote columns for The Washington Post. In a conversation with Columbia Journalism Review in March 2018,Khashoggi reflected on the ban. “I’m a believer in free journalism, despite all the limitations we had. I always pushed the envelope, I always wanted to have more space,” he said. The Saudi journalist’s killing has threatened to upend the historic US-Saudi relationship. The CIA reportedly concluded with “high confidence” that Khashoggi’s killing was ordered by Crown Prince Mohammed bin Salman, the de facto ruler of the kingdom. Riyadh has shifted its narrative on what happened to Khashoggi multiple times amid global condemnation, but has insisted Prince Mohammed was not involved. Meanwhile, bipartisan outrage has erupted in Congress over Khashoggi’s killing and the gruesome details that have emerged about his fate. But President Donald Trump has stood by Prince Mohammed and repeatedly touted the purported economic and strategic benefits of the US-Saudi relationship. Trump on Tuesday said the US “intends to remain a steadfast partner of Saudi Arabia” despite Khashoggi’s killing, and he’s been broadly accused of once again undermining the US intelligence community as well as the US government’s commitment to human rights. The president’s ongoing support of the Saudis throughout this crisis has led many critics to question whether his business ties in the country are influencing his foreign policy.